PARKING AT CLE AIRPORT: 1. Parking Fees for (a) Hourly Garage, (b) Long-Term Garage, (c) Economy Shuttle Lot. 2. General Parking Information. 3. Parking for Persons with Disabilities. 4. Parking Tips. 5. Directions to Airport. (a) Hourly Garage:	first half hour - Free; 31 mins to 1 hr - $3; each add'l hr - $3; daily max: - $14; lost ticket - $14. Payment Method: in cash, by personal check (except Economy Shuttle Lot) or by using a Mastercard, Visa, American Express, Discover or Diner�s Club card. Standard Parking will charge $25.00 for any returned checks. Automobile parking is available 24/7. The airport's on-site garages are operated by Standard Parking. Tel: 1.216.267.5030. Visitors who park on the first floor of the hourly/daily garage will be granted 30 minutes of free parking to allow them to drop off or pick up passengers. If no parking space is available on the first floor of the hourly/daily garage, park in the first available space. When exiting the hourly/daily garage, notify booth attendant that no 30-minute spaces were available. Automatic ticket dispensers distributing parking garage tickets are at the entrances of both garages. When exiting a garage, present the parking ticket to the cashier in the exit booth. 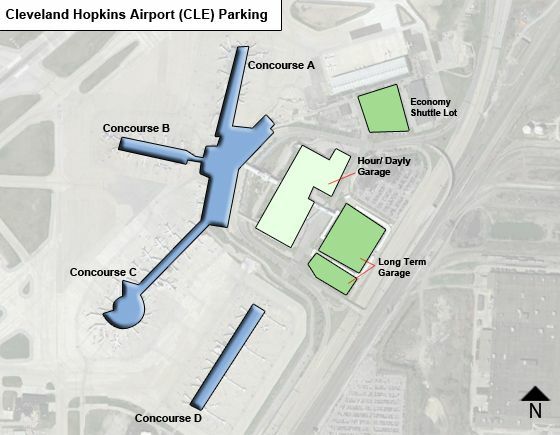 The new credit-card-only Economy Shuttle Parking Lot is located on-airport by turning right at the corner of Terminal and Park roads across from the Sheraton Hotel. The introductory cost is $7.00 per day. Shuttle service runs 7/24 to the door of the terminal. Service offers free USA Newspaper and a bottle of water. To remember the floor on which you parked, color-coded �You Are Here� cards are displayed at the elevators on each floor of both garages and at the shuttle lot. In the hourly/daily garage, the �You Are Here� cards are located on the sliding glass doors at the entrance to the speedwalk leading to the main terminal. All parking spots are marked with row numbers and you are advised to make a note of the row in which they parked. Security officers patrol the garages 7/24. White courtesy telephones are located in the elevator lobby of floors 2 through 5 of the hourly/daily garage, in the connector bridge between the hourly/daily and long-term garages, and on levels 1 and 3 of the long-term garage in the north and south elevator lobbies. Free emergency vehicle assistance is provided by Standard Parking. To obtain emergency vehicle assistance, dial 4770 on any white courtesy telephone, or dial 1.216.267.5030 from any telephone. Smarte Cartes are located in the elevator lobby on levels 1 and 3 of the hourly/daily garage, and on level 3 inside the connector bridge adjacent to the elevator lobby in the long term garage. The charge for Smarte Cartes is $2.00 and is subject to change. For visitors needing banking services, ATMs are located on levels 1 and 3 of the elevator lobby located between both garages and the terminal. - Wheelchair-accessible restrooms on each of the four concourses as well as on the baggage claim level of the main terminal. - Family restrooms in the center of the baggage claim level of the main terminal, next to the USO Office, and on the south end of the baggage claim level. One additional family restroom is on Concourse A, just beyond the A checkpoint screening area. Family restrooms are large enough to accommodate two or more individuals, and are wheelchair accessible and ADA compliant. - Travelers who wish to have wheelchair service while in the terminal should contact their selected airline for assistance. - Parking is available 24 hours a day, 365 days a year. - Automatic ticket dispensers issue parking tickets at each garage entrance. Present this ticket to the cashier as you exit.